Thank you for narrowing the field of blues for me. I don't think that this will be one of the blues that I investigate further. Actually not all that bad--although it's true there isn't much shading with this ink. But I used if for 3 years with several of my Pelikans until I discovered Diamine inks. The rest is history, as they say. Strange how different this looks from my bottle. Pelikan Blue for me is very very faded and ugly. The blues when they are scanned tend to be brighter and bluer and nicer than on real life. Unfortunately, many blues that are lifeless on paper appear gorgeous on scans. Thanks for the effort, anyway. You try to help others. The last bottle I bought was very purple - almost like PR Tanzanite, I was about to send it back to pelikan but then realized that I quite like it. It appears that the color can differ from batch to batch. Thanks for the review! I find this a useful, general purpose, blue. I think it's attractive. It doesn't have the "wow" factor of Visconti, or the school-look of Skrip. Just a nice, every-day blue. "Even accidentally swallowing ink would not harm the average person. We do however warn against consumption as ink is not to be considered as nutrition." I have just heard about Diamine inks...what makes them so good? P.S. I'm using Pelikan Royal Blue these days and very happy with it. No feathering whatsoever on my Apica and Clairefontaine papers. Very tight. Looks gorgeous to me. I actually used it today (cartridge) in a Pelikan Future pen (fine nib). Interestingly the el-cheapo Future pen is probably my smoothest pen, smoother even than my Pilot M90 (medium nib). The Pelikan fine nib does write close to a medium though. The ink looks beautiful. Edited by haziz, 30 June 2009 - 23:29. ...did they give a definition of 'average person' ? Do any of us qualify ? I ended up with 2 bottles -- one I purchased on clearance for a few dollars, and another came unexpectedly with a NOS M200 that I bought. One was much more purple than the other. But in the end I found them both kind of faded and drab. Yes, both are for a reason the two more sold inks in the Old Continent. 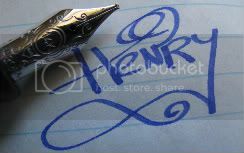 Excellent behavior, solid classic blue color, writes on anything, safe for pens and most important of all, people, (no chemical fumes menacingly emanating from the bottle). A great product made for one of the top pen makers. Sound German Engineering in an everyday ink with respect for the quality and safety for environment and humans at the best market price. In Switzerland (cartridge) it is the standard ink, that all chidren are using at school. You ca find it in posr and all supermarkets. Because children are learnig to write with Pelikano funished by school. It's more difficult to find the black or other color. The new one is better than the old one and darker. I highly doubt that any one of us will be qualifed as an "average person"
Royal blue is an ink that I use daily. It is a safe ink, and blue it is. I have not experimented with other blue inks yet, so I like it. Verba volant, littera scripta manet. THIS WONDERFUL COLOR CANNOT BE THE UGLY PELIKAN ROYAL BLUE I HAVE.